Miss Annie Oakley, of Pine Brook. People were all agog at Pine Brook, New Jersey, on Monday, 7th inst., as team after team, hauling loads of merry men, pulled up at Frank Class' Club House. It was evident that something rather out of the ordinary order was going to take place. "What does this gathering and noise mean?" asked sober-faced Deacon Jones as he pulled up the old mare Dobbin, "Is there going to be a Van Due or a circus intown?" "Wal, no, Deacon," said an honest-faced tiller of the soil, "not exactly that, but something a darned sight better, and if you'll just pull the old hoss up here I'll explain. "I suppose you have heard of this man Graham, the wonderful one-armed pigeon shot that's been residing up here for awhile (as he says to keep himself in practice on the quiet)." "Oh! yes," replied the Deacon, "I have been trying to get him to join our congregation." "Wal, Deacon, to make a long story short, you see there is a lady visiting at his house, and she is a gol darned good shot with the gun, and so a lot of us boys got Mr. Graham to prevail on her to give an exhibition before she left these diggins and she has consented, and we are waiting for her to commence." "Wal, now, look here, John Saunders, you, you quite interest me. Is she very young?" "Wal, I don't know, Deacon, she looks as though she mout be twenty, but I tell you, Deacon, she's right smart-looking." "I reckon, you rascal, John, you always did have an eye for good-looking girls, but, howsomever, John, I guess as I have driven the old mare pretty sharp the last [?] e miles, I'll jist tie her up and put the [?] anket on and stop in to see the Widow Jenkins. I understands she want to sell her cow." "Wal, look here, Deacon," said John, if you are a going to hang round to catch a look at this ere young gal shooter, I had better tell you that I heard she was sorter connected with Buffalo Bill's Wild West Exhibition, as perhaps if some of the congregation were to see you hanging around looking at an entertainment of this kind, they might think you'd fell from grace." "Wal, you see, John, that's just why I'm [?] going over to the Widow Jenkin's house so I can look out of her second-story window and take in the show, so don't give [?] away. Good-bye." 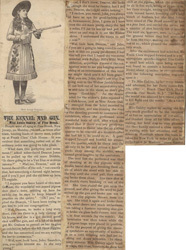 As the deacon headed for the widow's, John repaired to the club-house, just as Miss Annie Oakley emerged from the hotel escorted by her attendant, and was crossing the road to the shooting grounds to commence the exhibition, where she performed some wonderful feats of skill, after which she stated that if there was any gentleman who desired to throw into the air a silver quarter to be reserved as a memento after she had hit it, he could do so. A gent. stepped forward and handed her attendant the quarter, which he threw into the air only to be hit and driven a hundred yards away among the stubble, which caused great laughter by the spectators. The next feat she performed was that of shooting at 20 clay pigeons with a double barrel shot gun, breaking them all, six of which she stood with her side to the trap until she cried pull, then wheeling broke them clean. She then shot at six double risers, breaking 11 out of the 12. She then placed the gun upon the ground, and after giving the word to pull, picked up the gun and broke one out of the two clay pigeons thrown from the traps. She tried it again and broke them both, amid cheers and much enthusiasm, then taking a Spencer repeating shot-gun she broke six glass balls thrown into the air, in four seconds (by the watch). An intermission was then taken while the live pigeon traps were placed in position, so for the purpose of giving the shivering spectators an opportunity of warming up, as a cold, drizzling rain had set in, making out doors miserable. In about twenty minutes Miss Oakley again faced the traps, this time, however, to show her skill at live pigeons, which she proceeded to do in fine style, killing at 25 yards rise her three straight, hitting the fourth hard with second barrel, knocking out a large bunch of feathers, but the bird having been raised at Pine Brook seemed as hard as a pine knot, and carried the ounce and a quarter of shot bravely out of bounds. The next six, however, were brought to the ground before they had proceeded far from the traps, making the score of 9 out of 10, which pleased the assemblage very much. "To Miss Oakley, by her many friends and admirers, for her Performance Feb. 7th, 1887, at Frank Class' Club House grounds, Pine Brook, N.J." The face of the medal was adorned by a raised pigeon in full flight and the words: 'As a token of skill.'" Miss Oakley replied by saying she felt very much gratified to be the recipient of so fine an appreciation of her ability, and thanked them all for their efforts in making her brief stay so very pleasant. She then hastily entered a close carriage in waiting with her attendant and was driven to Montclair where the train was taken for New York in order to give her performance in Madison Square Garden.